Eyes are the windows to the soul, they say. 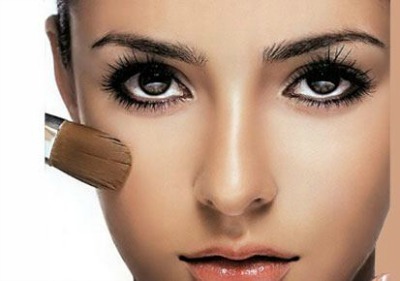 If we do up our eyes, and keep everything else simple in our makeup routine, it instantly makes us look more awake, and bright; not to mention absolutely gorgeous and stunning! 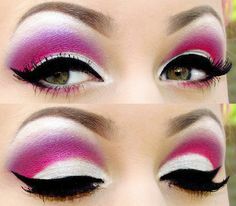 So here are 25 stunning eye makeup pictures for you to be inspired from and enable you to unleash your creative side! This beautiful combination of pink and gold is such a stunner! It will go very we with traditional clothes, and you are sure to be the show stopper at weddings if you try this look! 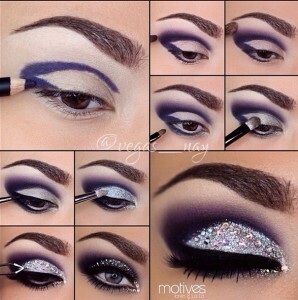 This is an excellent look to try if you want to incorporate some drama into your look. The classic smokey eye is given a twist by adding some hot pink and tiny peeka-boo of gold, it is finished off with black liner to really accentuate the eyes. The Arabic look is filled with drama, add lots of colors and lots of liner and you are good to go. It’s a great look to tea with a plain saree, as it will allow your eyes to truly stand out. This is such a lovely marriage of colors, with the yellow, and the smallest dash of blue. 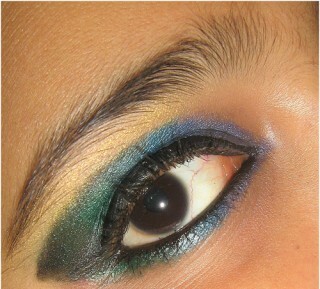 It’s a great look to try during summers, as it is fun and colorful! Peacocks are known for their beautiful and vibrant colors! This look does the same. Its not for the faint hearted, but if you can carry it off, it will look absolutely stunning! Best when worn for a night out, or a special date! If you are into animal prints, this look is for you. 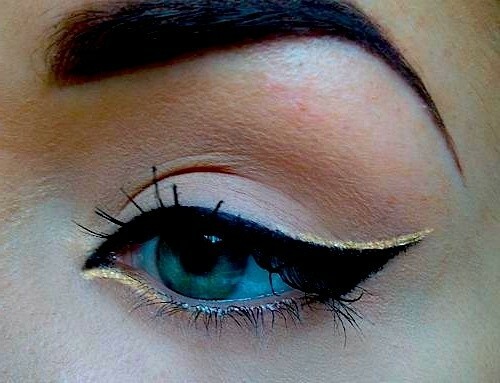 When you want to keep everything else simple but want a very bold eye look, this is perfect! It would add wonderful drama to a simple LBD. 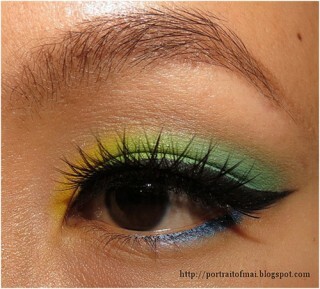 This electric green look is great if you want a sudden burst of color to break the monotony of your outfit! 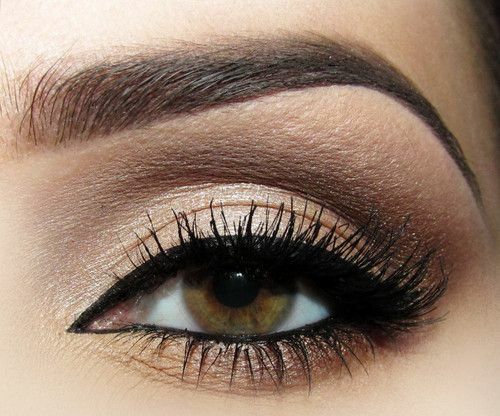 This look is mainly neutrals topped with a heavy smudged winged eye. Its great for stage performance, night outs, or even to a fancy lunch date! It will also pair very nicely with traditional attire. This is a brilliant mix of the two colors, each complementing the other one. Shades of silver can also be seen along with the dark green and purple. It is finished off with winged liner in black. 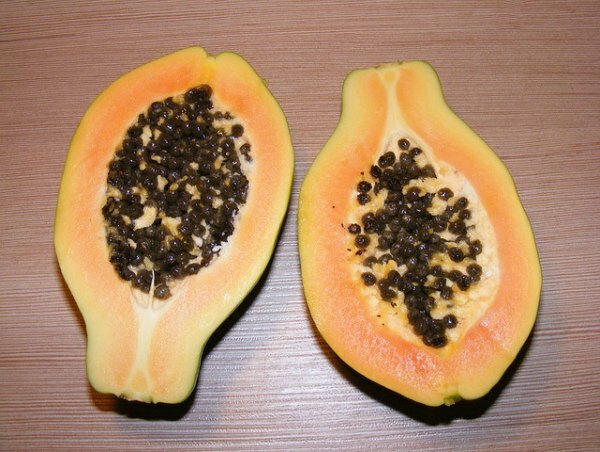 It will pair well with a simple LBD or traditional attire. This look uses an extremely bright yet gorgeous shade of pink. 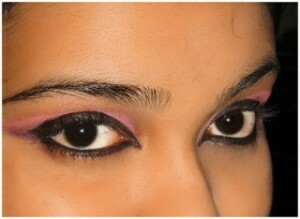 It is finished with black liner, which really opens up the eye. 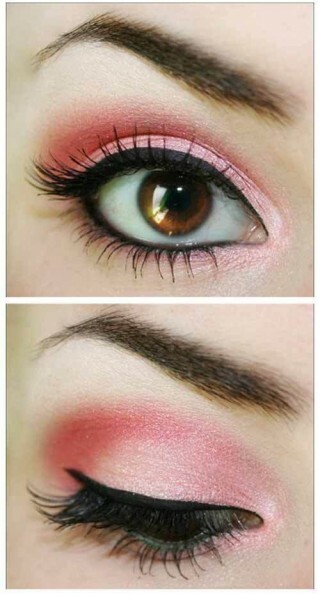 This can be an everyday look, if the pink is toned down slightly. It can also be worn for a special romantic date with your special someone. This is a simple yet elegant look, and it incorporates the three colors very nicely. 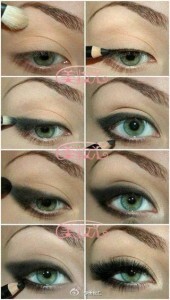 The inner waterline is lined in a neutral to make the eyes see brighter. This can easily be worn as a day look. This is an extremely simple yet sophisticated look. It will look great with traditional wear or for a night out. This look upgrades the neutral look ever so slightly. Its more dramatic, but nothing overwhelming, it can be easily be worn to office or to college. It is also a great look that can transition from day to night. This is another simple yet dramatic smokey look. Its really easy and can be used for a very special outdoor event. This look is best suited for blue eyed beauties. Don’t have natural blue eyes? No worries, just pop in those contact lenses and you are good to go. It subtlety goes from green to golden to bronze. This look is gorgeous, and it is absolutely perfect for stage shows or when you just want to really stand out from the crowd. Be warned though, it is not for the faint hearted, and you need to be really confident and really work the look. This vibrant, colorful look is great for summers! Its especially good if you have a party to attend or are on vacation with your sweetheart. Try it, it is sure to turn heads. Taylor swift really knows how to pay up her best features, and her eye makeup is no exception. Its great for all your casual outings, and is even good for a day out with your friends. A winged liner effortlessly brings in drama. It takes a bit of time to master, but once you get the hang of it, you are going to be hooked! It really is addicting. And it beautifully goes from day to night with so much of ease. 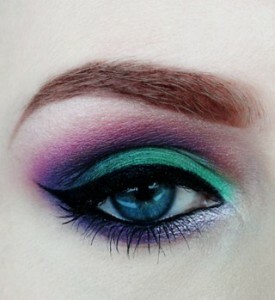 Ombre is quite in right now, and the eyes are no exception to this trend. You can wear it to work, an outing with your friends or even to a romantic dinner. Its that flexible! It’s a great thing to master as it will serve you well! This is another great twist to the smokey eye, the yellow gives it a real pop of color, and it is a great look to try for spring. 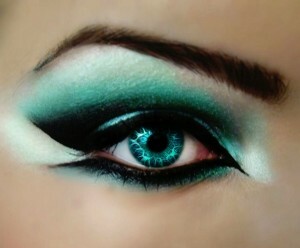 This is an extremely stunning look, and it will especially look good on people with blue eyes. It is dramatic yet gives a mystical touch. It is very fairy tale like and the white shadow really opens up the eye. It is great for when you have a very drama filed evening coming up. This hot pink and white combo is super girly and super flirty! It’s a very fun summer time look, and you are sure to look your girly best when sporting this look. This is great for evenings or if you have a white dress wedding to attend. 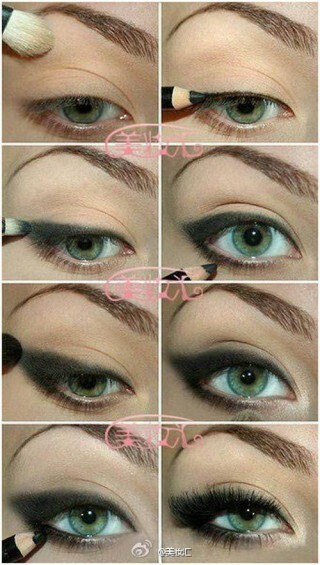 It draws a lot of attention to your eyes, and will look amazing on just about anyone!